The 10 most commonly kept breeds of chicken including; their suitability for egg laying and /or meat production, their basic requirements and adaptability to your specific climate, and perhaps most importantly if you have children – their different temperaments and personalities. A detailed discussion on chicken coops including size and space required, accessibility issues, ventilation and insulation, and the placement of your coop. You’ll find out how much space you really need and the answer might just surprise you. Should you buy a ready made chicken coop? Should you build your own from scratch or knock up a kit set coop? Does a chicken really care if it lives in an old dog kennel? We look at all these answers and more to help you make an informed decision that will keep your chickens, your wallet… and your “significant other” happy. Choosing the right bedding material to use on the floor of your chicken coop is extremely important. Get it wrong and the health of you chickens may suffer. Get it right and you’ll reduce smelly odors, maximize hygiene, and minimize cleaning time and requirements. We discuss various bedding material options here and look specifically at those that you can then use as high yielding organic compost for your garden. Are you going to let your chickens out every day to forage around your yard so they can scratch for bugs, grubs, and insects becoming a natural form of pest control? Or should you keep them secure in their own chicken run? If you do let them out how are you going to control them? You’ll find out everything you need to know here. Your new hens are going to need a place to nest inside their home so they can reward you with fresh eggs daily. We look at different types of nesting boxes, their size requirements, positioning, and the ideal number to have to maximize egg production without taking up unnecessary space in the coop, or increasing your hobbies expenditure. Did you know that chickens don’t actually sleep inside their nest boxes? At night they actually roost on perches so you’ll need to ensure their new home has a suitable roosting place. We discuss different perching options, including thickness requirements, positioning to reduce fighting for the “prime roost”, the correct height that they should be placed, general spacing requirements, and common materials. Having the right tools and equipment for your new flock is a must to ensure harmony amongst “the pecking order”. You’ll learn about suitable food and water dispensers, how many you should have depending on how many birds you keep, where they should be placed, and whether you should go for the cheaper plastic varieties or the robust but more expensive options. We take a detailed look at the chicken’s digestive system, how it functions, and what’s natural so you can keep a close eye on things to ensure everything’s normal. How much should you feed your chickens? When should you feed them? Should you use a commercially brought feed or a home made feed? Here you’ll receive a detailed education on the proper nutritional requirements for maintaining a healthy chicken based on differing needs during its lifetime. If you want to make your own chicken feed we provide you with 3 easy homemade chicken feed recipes. Now you’ll know exactly what you’re putting into your chickens and ultimately what’s going to end up inside you when you consume their eggs. If you’re going to supplement your chickens feed with your own household scraps you’ll learn what you can and can’t feed your chickens. Some household scraps can become real treats for your flock; others can be detrimental and even fatal to their health and should never be given to them. We take a detailed look at chicken pellets, chicken mash, cereal feeds, greens, calcium and other vitamin and mineral supplements, chicken grit, “scratch” and much more. Knowing how your chickens should and should not behave in their regular daily routines is fundamental to ensuring everything is fine. You’ll learn about your chickens common behavioral habits such as broodiness, preening, roosting, and more. You’ll learn about the “pecking order” and what to do when you see one of your hens being picked on by other birds in your flock. The “pecking order” is completely natural in chickens but often it can get out of control. You’ll learn exactly what to do if one of your hens becomes too aggressive and the bird on the receiving end becomes injured or hurt. You’ll also learn about less common behavioral habits such as feather pecking, egg eating, cannibalism and more. Nip these last ones in the bud before they get out of control so one of your girls doesn’t end up getting seriously hurt, or even worse, potentially killed. We take a look at 3 of the most common minor aliments that can impact on the health of your chickens, and then a whooping 25 serious aliments that might impact them at some point in the future. Each includes a full description of the aliment and appropriate suggestions on treatment and the course of action you’ll need to take to keep your chickens in tip top condition. We take a look at 8 of the more common types of parasite that can take a fancy to our feathered friends, how to minimize their occurrence in the first place and what to do if they’ve already arrived and are irritating your chickens. Thorough cleaning and hygiene will dramatically reduce any associated health problems and is therefore critically important to the overall health of your flock. We look at how to properly clean out your chicken coop, and what types of cleaning martial you should use to ensure the safety of your birds – whilst at the same time maintaining the cleanest and most hygienic housing possible. 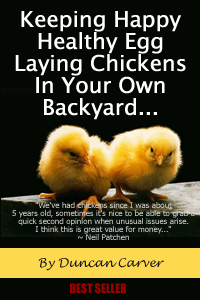 ..."Keeping Happy Healthy Egg Laying Chickens In Your Own Backyard" has been produced in digital (PDF) format, so it's available for you to download to your computer and read right now, even if it's 2 am in the morning. You will be able to download the book immediately after payment has been made and you’ve completed registration for our private customers area (a 30 second process). FREE VOLUME III: POULTRY APPLIANCES AND HANDICRAFT. This publication will teach you how to make and use time saving chicken keeping & management devices to ensure you're chickens require as little of your time as possible. The less time you spend looking after your chickens, the more time you'll have to enjoy them! "The Poultry Doctor" contains absolutely everything you need to know about the health of your chickens. This is one stella book to keep handy! You see we've been publishing the “Chicken Keeping Secrets” email newsletter for just over 3 years now. It contains more than 87 individual back issues of hard hitting professional chicken keeping advice – 700+ pages when printed. There is no fluff or filler information here – just practical detailed advice to chicken questions that members just like you have submitted. These back issues are not made available to the general public – even though we get numerous requests each day to send them to people who want to “catch up” on all of the excellent content. When you order now I’m also going to include personal access to every single back issue published to our customer only blog.